A business case captures the reasoning for initiating a project or task and helps convince a decision maker to take action. A well-structured, formal document, the business case tells the story of an initiative from beginning (what problem or situation triggered the initiative) to end (what benefit, value or return is expected). Business cases are typically written at the project or initiative level as a way to secure funding and commitment. Using a business case for change management directly addresses these common challenges and objections. 1. What is the Project or Task? A business case proposes a specific project or task. Your “project or task” is to apply a structured change management approach on a particular project or initiative. 2. What is the Reasoning? A business case presents the reasoning and rationale for initiating the project or task. For the change management business case, the reasoning is that the ultimate benefit realization, value creation and achievement of results and outcomes for the specific project or initiative are directly tied to managing the people side of change. 3. Who Are We Trying to Convince? The audiences of a business case are the decision makers who can ultimately take action in terms of funding and support. For the change management business case, your likely audiences are senior leaders, project leaders and project managers. 4. What is the Action We Need? While the business case is a common tool when relating to projects and initiatives, few change management practitioners have taken the step of translating the rationale and approach for change management into a formal business case. 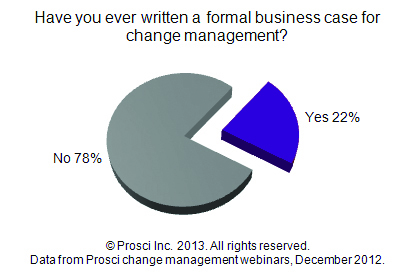 In one Prosci webinar, only 22% of attendees had written a formal business case for change management. Directly connect the results, outcomes, value and benefit realization of the initiative to the people side of change. The situational assessment and problem statement do not directly mention change management, but instead shows dependencies. Present the high-level description, scope, and objectives for the project or task. 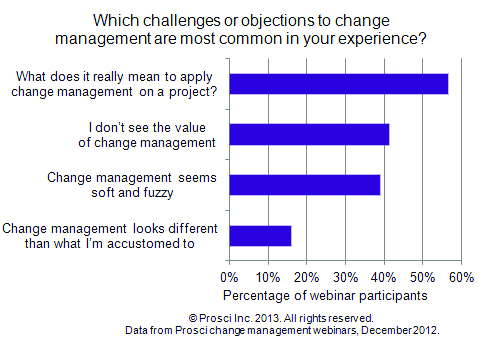 In this case, the task is applying change management. By concretely defining the task of applying change management, you give the reader confidence that you will effectively address the situation presented. Summarize your solution of applying change management and present milestones, work streams and measurements for change management. By using artifacts familiar to project leaders, such as milestones and work streams, you make change management tangible and less fuzzy. 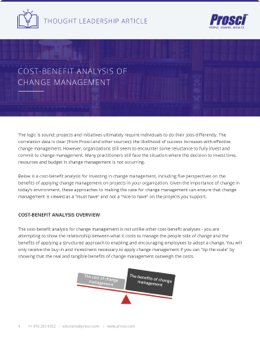 Clearly present the costs and anticipated benefits of applying change management. The benefits section should focus on the delivery of project results and outcomes and can include both the benefits we get from applying change management and what can happen if we do not apply change management. Solidify the structured approach and build credibility by mapping change management milestones to existing project milestones, such as kickoff and go-live. Present a SWOT analysis (strengths, weaknesses, opportunities, threats) and dependencies for applying change management. Clearly articulate the "ask" (resources, funding, authorization, support, etc.). This builds confidence that your solution solves the presented situation. The business case is a powerful vehicle for presenting the rationale and approach for change management, because it helps to address some of the most common objections or challenges to change management. The project description and solution description sections of the business case for change management present, in concrete and real terms, what it means to apply change management on the project, including general description, scope, objectives, work streams and milestones. The situational assessment and problem statement section of the business case for change management directly connects the results and outcomes of the project to managing the people side of change. Without even mentioning change management, this section is an avenue for showing how achieving project benefits depend on the ultimate adoption of the solution by impacted employees. Using a business case in and of itself addresses the perception of change management as soft and fuzzy. By presenting your "people side of change" approach and rationale in a formal business case, you gain credibility and show that you are a serious player in the execution of the project. A business case is familiar to project leaders and senior leaders. So are elements like scope, objectives, work streams and milestones. By telling the story of change management in a familiar format, managing the people side of change looks like what they are accustomed to seeing in the project space. There are numerous ways to tell the story of change management. A business case is just one, but because of its formality, structure and familiarity, the business case can be a very effective tool for gaining support, commitment, authorization and funding for change management. Presenting a formal business case for change management to a project leader or senior leader can earn you the credibility you need to make a difference on the project. The logic is sound: projects and initiatives ultimately require individuals to do their jobs differently. But many practitioners still face the situation where the decision to invest time, resources and budget in change management is not occurring.